The dollar aisle at Target during Christmas is a dangerous place. But like the sucker I am, I see one $5 pie plate and I’m gone. I’m pulled into that vortex of cheap-but-cute items, convincing myself that I need the fake garland for my apartment that in no way, shape, or form has room for garland. And every year, I’m sucked in once again by the materialism and consumerism of the holidays. In our culture that, for the most part, completely ignores the true meaning of Christmas, how can you be a beacon of light that shares the real reason for the season? 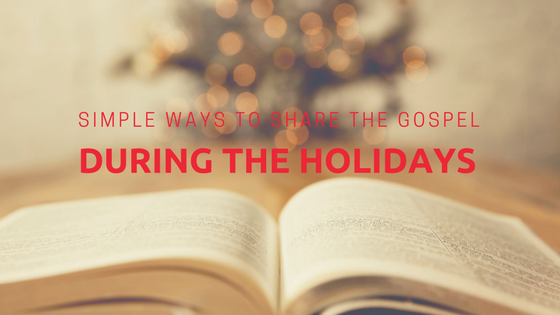 Here are a few simple ideas to help you share the Gospel during the holidays! For some people, sitting around the dinner table at Christmas means arguing about politics, religion, or some combination of the two. If you have a family member who isn’t a Christian, it can be hard to find the line between witnessing and starting a conversation that quickly escalates into an argument. You can share the Gospel in simple ways—like praying before you eat, sharing that you’re thankful for the birth of Jesus, or even going to church if the rest of your family doesn’t attend. Christmas is such a materialistic and commercialized holiday today, as we all know. Just take a look at any Christmas movie, storefront, or house—Santas, sleighs, and snowmen are the focus, not Jesus’ birth. Each family has a different way to focus on Jesus. Some forego Christmas gifts altogether, donating money that would have been used for presents to a charity or other organization. Others limit children to one gift or a dollar amount. Whatever your family decides to do, the goal, of course, is to keep Christ in Christmas. Sharing the Gospel can begin in your own home—reading the Christmas story in Luke 2 before you open presents can refocus your family’s hearts. If you work in a place that doesn’t recognize Christmas as a Christian holiday, you might feel hesitant to share the Gospel even in small ways in your workplace. But there are some simple ways you can share the Christmas message with your co-workers in a way that won’t impact your job. Say “Merry Christmas” instead of “Happy Holidays,” or share your plans for church services or other Christ-centered activities you have for this season. How do you share the Gospel during the Christmas season? Does your family have any traditions to help keep Christ at the center of your celebration?